The Cambridge Community Foundation (CCF) and its donors have awarded $944,378 in grants this spring, with $692,878 going to 93 local nonprofits and to scholarships. The grants are funded through CCF’s Community Fund, our endowment and Donor Advised Funds (DAFs), and investments in ongoing CCF initiatives. The only foundation focused exclusively on the needs of Cambridge residents, CCF supports nonprofit organizations involved in human services, workforce training, housing, hunger, homelessness, elder services, youth and early childhood services, education, and the arts. 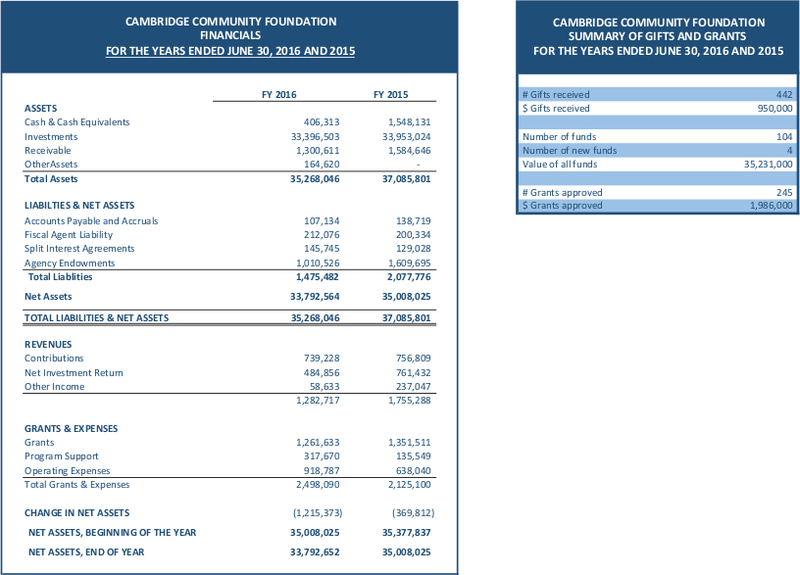 Through these investments CCF supports shared prosperity, social equity, and cultural richness in Cambridge. Of the total local investments, CCF’s Community Fund, an endowed fund that supports the nonprofits in Cambridge, awarded 69 organizations a total of $388,000 in grants. Nonprofits supporting education and out-of-school time received a quarter of the Community Fund grants, followed by urgent and basic needs (17%) and arts & culture (12%). Nearly half of the nonprofits receiving funding in this spring cycle have been supported by CCF for decades. The grantees were selected by a committee of civic leaders and community members, including former executive directors of nonprofits, CCF board members, and a poet. In addition, this spring CCF and its donors contributed $196,900 to support ongoing initiatives. These include a grant of $140,900 to Family Independence Initiative to extend FII support to low-income families in Cambridge for pathways out of poverty, and Biobuilder’s renewed grant of $25,000, as part of our three-year $75,000 investment giving local high school students hands-on experiences in biotech labs. CCF donors infused a total of $409,478 into nonprofits and scholarships through endowment and Donor Advised Funds, with $157,978 going specifically to Cambridge-based nonprofits. CCF is the local giving platform for Cambridge supporting our city’s shared prosperity, social equity, and cultural richness, with roots that go a century deep. The Cambridge Community Foundation connects sectors across the community, to highlight emerging and critical needs, and catalyze efforts– from fundraising and grant making, to civic engagement– to ensure resources are focused where they can make the greatest difference. Bridge Over Troubled Waters — $7,500 for Street Outreach and Mobile Medical Van programs to connect runaway, homeless and street youth with services to reduce their risk of long-term homelessness. Cambridge Family & Children’s Service — $3,500 for Family Support Center which offers a wide range of flexible services to support families caring for a child or an adult with a developmental disability. Community Servings — $6,000 for Nutrition Program for Cambridge residents affected by an acute life-threatening illness. Cradles to Crayons — $3,500 for a partnership between Food For Free and CTC’s Everyday Essentials program which provides clothing, school supplies, and other items children need. FamilyAid Boston — $5,000 for the Family-to-Family Project, which supports families at risk of homelessness through flexible funding grants and comprehensive case management. The Friday Café — $2,000 for a welcoming space where homeless and housed neighbors can gather and get to know each other. The café offers food & coffee, rest & resources to people living on the margins, as well as community. Heading Home — $5,000 for the Susan Duley House, which serves single homeless women through permanent, supportive housing and intensive case management. HEET (Home Energy Efficiency Team) — $3,500 for Meeting Cambridge Net Zero Action Plan: HEET will perform energy assessments on the buildings of 4 nonprofits and work with their leadership to address the issues that arise. With 2 of these nonprofits, HEET will also weatherize the buildings. Metro Housing Boston — $7,500 for the Center for Hoarding Intervention which provides intensive case management for low-income residents struggling with hoarding disorder and at risk of eviction, as well as training for service providers. On The Rise, Inc. — $7,500 for Keep The Keys, a housing retention program for formerly-homeless women, which provides support groups, home visits and other services to chronically homeless women as they move into their own apartments. Transition House — $10,000 to establish Family & Children’s Health Services Program which will expand access to healthcare services and case management for 180 disadvantaged children and families residing in TH’s emergency shelter and supportive housing programs in Cambridge. Women’s Educational Center, Inc. — $5,000 for Drop-In Program for low-income, homeless and abused women. Adolescent Consultation Services, Inc. — $7,500 for Direct Mental Health Services for court-involved children and their families including specialized psychological evaluations, counseling, and advocacy at no cost to families. Cambridge Health Alliance — $2,500 for Sibling Support: Family-Centered Mental Health Initiative program which addresses the trauma experienced by family members of youth admitted for psychiatric hospitalization. CW Taekwondo at Boston — $2,500 for Martial Arts Outreach Program, which reaches into the community connecting youth to world-class movement arts education at an affordable price and access to life skills (bullying and stranger danger). EChO: Eradicate Childhood Obesity — $2,500 for Sweet Fairy Tale musical designed to educate the audience about the dangers of added sugar in their everyday foods and to inspire them to make more nutrition-conscious food choices. Emerge — $4,000 for the Counseling Scholarship Fund, which allows low-income and un-employed people to complete the domestic violence abuser education and counseling program. Girls’ LEAP — $2,500 for Lifetime Empowerment and Awareness Program which teaches physical safety skills and socio-emotional skills to develop girls’ self-awareness, conflict resolution skills, courage, and self-esteem. Green Streets Initiative — $2,500 for Healthy Commuting Conversation & Community, expansion of Walk/Ride Day events to Cambridge housing developments, with other community organizations, to engage residents in conversations around active commuting, so that all voices are heard and shared. Market in the Park — $5,000 for weekly no cost farmers markets held by Homeowners Rehab and community partners in HRI housing developments. Parenting Journey — $4,000 for Parenting Groups — evidence-based, therapeutic supports that address the parenting challenges families in poverty face and their impact on wellness. VNA Hospice & Palliative Care — $3,000 for meeting end-of-life needs for terminally ill Cambridge residents and their loved ones. New Communities Services, Inc — $5,000 for expanding outreach for services especially to homeless elders and adult disabled persons. SCM Community Transportation — $3,000 to keep the approximately 90,000 one-way rides provided each year accessible by all by assisting in lift repair. Urbanity Dance — $1,500 for Dance With Parkinson’s at Youville House, free program offering the health benefits of dance for people suffering from chronic disease. Adbar Ethiopian Women’s Alliance — $5,000 to expand Adbar’s literacy projects (children’s language development & computer literacy) and for a catering service that provides economic empowerment by creating job opportunities and bringing women together to share common concerns and find solutions. Cambridge Economic Opportunity Committee, Inc. — $20,000 to expand CEOC’s bundled services approach to offer a more robust menu of financial capability services. Participants served include racial and ethnic minority households, especially those with limited English Proficiency and low-income households. Compass Working Capital — $7,500 for the Financial Stability and Savings (FSS+) Program which supports families that receive assistance through Cambridge Public Housing to build assets and financial capabilities as a pathway out of poverty. Found in Translation — $4,000 for Language Access Fellowship Medical Interpreter Certificate Training and Job Placement Program which enables low-income and homeless bilingual women to launch careers as professional Medical Interpreters and at the same time addresses a major language barrier to health care by providing interpreters. Community Action Agency of Somerville — $7,500 for Early Childhood Teacher Training Program, which trains parent volunteers as paid substitutes, providing them income and a career path while increasing the number of trained teachers. Horizons for Homeless Children — $3,000 for 3 play spaces in family shelters in Cambridge which are developmentally appropriate and trauma-informed, “kid-friendly” spaces led by volunteer activity leaders. Reach Out and Read — $5,000 for Cambridge Early Childhood Rx for Success which promotes early literacy by working with pediatricians who give books to children at each well-child visit from infancy through age 5 & encourage families to read together daily. United Way of Massachusetts Bay — $5,000 for Shared Services program for Child Care providers in Cambridge & Somerville utilizing an Early Childhood Education web platform and tools working with Cambridge’s Birth to Grade 3 Partnership. Afterworks — $4,000 for scholarships to the after-school program, providing high-quality care; tutoring and homework help; inclusion and cross-cultural understanding through the arts; and support for working parents. Beyond the 4th Wall — $4,000 for a spring musical program working with over 120 youth from every school across the city. Boston Mobilization — $4,000 for Sub/Urban Justice, a youth leadership program that intentionally brings teens from urban and suburban backgrounds together to strengthen their community organizing capacity while building relationships across neighborhood, class and race through paid internships. Cambridge Children’s Chorus — $3,500 for Chorus Music & Youth Development Education: sequential programming for children age 4 – 9th grade, supported by seasoned artistic staff with the assistance of Cambridge-based teen mentors and teaching fellows. College Success Initiative — $15,000 for Campus-Based College Success Coaching Program which provides 2 full-time coaches on-site at Bunker Hill Community College and UMass Boston who support CRLS, Bridge to College, and Youth Build alumni with academic and non-academic challenges; building self-efficacy and advocacy skills; educational and career opportunities on and off-campus. Community Boating — $3,000 for Environmental Science Program (ESP) which engages middle schoolers in a wide array of STEM activities through hands-on experiences. Community Charter School of Cambridge — $2,500 to integrate hands-on, inquiry-based, standards-aligned lessons into the middle school curriculum through a Campus Garden. Discovering Justice — $2,500 for a K-8 literacy-based experiential social studies and civics curriculum that gives students a deeper understanding of democracy. Mass Audubon’s Habitat Education Center and Wildlife Sanctuary — $1,500 for Local Wildlife Project, which takes place at the CPS Maynard Ecology Center at Fresh Pond and serves all second-grade classrooms in Cambridge. Philanthropy Massachusetts: The Summer Fund — $20,000 for Cambridge camps. This donor collaborative was established to steward the fair and equitable distribution of resources to ensure access to summer opportunities for underserved youth. Phillips Brooks House Association: CYEP — $3,500 for Cambridge Youth Enrichment Program, which offers seven weeks of affordable summer programming to 160 low-income children from three Cambridge housing developments. Tech Goes Home — $7,500 for Digital Inclusion Programs to bridge the digital divide by providing: free digital skills training, the opportunity to purchase Chromebook inexpensively, help securing low-cost, high-quality internet. Triangle, Inc. — $2,000 for IMPACT:ability Program Expansion in Cambridge Public Schools, this program teaches students with disabilities safety skills to combat epidemic rates of abuse perpetrated against individuals with disabilities. uAspire — $5,000 for College Affordability Advising for high school seniors in Cambridge. The goal is to ensure matriculation in an affordable postsecondary program. Work Force — $15,000 for the Work Force Youth Program, a seven-year comprehensive educational support, college prep, and career-readiness program serving 275 low-income teens that live in Cambridge Public Housing. Cambridge Community Television — $15,000 for Youth Media Program, which promotes healthy youth development by providing under-resourced young people with training and support. Focus this year: using Virtual Reality to Combat Climate Change. The Loop Lab, Inc. — $7,500 for a media production organization that prepares young adults to work in the digital economy by providing a 6-month technical skills training, a 19-week in class training followed by 200 hours of an internship in a local organization. Irish International Immigrant Center — $5,000 for legal services for immigrant youth who are homeless or at risk of homelessness. The Center offers free legal help directly to schools, shelters, community organizations, as well as educating the adults who work with at-risk youth. KIND (Kids in Need of Defense) Inc. — $10,000 for a medical legal collaboration with Cambridge Health Alliance overseen by a KIND attorney and paralegal [KIND provides legal referral to CHA patients and refers KIND clients to CHA for medical assistance] which increases local awareness about legal representation within the immigrant community and ensures KIND clients have access to holistic care. Political Asylum Immigration Representation Project, Inc. — $5,000 for Community “Know Your Rights” for Immigrants which is an initiative to empower immigrants to understand and use their constitutional rights regardless of their immigration status. The PAIR Project provides free legal representation to asylum seekers and immigrants unjustly detained. Veterans Legal Services — $4,000 for Veterans Legal Clinics which provide free, accessible legal services to promote self-sufficiency, stability, and financial security of homeless and low-income veterans. Cambridge Historical Society — $2,000 for “Sweet Souls” storytelling event & workshops in The Port at Margaret Fuller Neighborhood House which will use the power of storytelling to listen to people across divides, offer people tools to shape and voice their stories, amplify pride in MFNH’s history of service and activism in The Port, and preserve these stories that are central to Cambridge’s progressive identity. Cambridge Volunteer Clearinghouse — $20,500 for program that supports individuals/groups by identifying volunteer positions, offers free workshops, provides access to online posts & quarterly news, offers personalized coaching services and workshops for volunteer managers, and is creating a mobile-friendly database with searchable, job specific data for 150 agencies. Harvard Square Churches Meal Program — $4,000 for weekly meals serving the homeless and under-served; providing stipends to 3 homeless people to help with food preparation/serving; supporting 3 adults with intellectual disabilities to volunteer in food sorting/packaging; providing a Market Place at the beginning of each meal, containing fruits, vegetables, bread, peanut butter, and other items. Solutions at Work, Inc. — $7,500 for Beyond Shelter: Serving the Neediest: Children’s Clothing Exchange, where low-income people can swap outgrown children’s clothing, and SolutionsWear, which provides interview appropriate clothing for low-income adults. Cambridge Arts Council — $5,000 for Summer in the City which offers free culturally diverse arts programming outdoors in every Cambridge neighborhood over the summer. Cambridge Center for Adult Education — $2,500 for Blacksmith House Poetry Series which offers poets a long-respected and well-publicized public forum, and gives the community an accessible, welcoming place to hear poetry read in public. Cambridge Forum — $1,000 for Poetry Fuels Democracy, a free live arts event with an audience within an industrial space featuring poet, Richard Blanco, as a new collaboration with Charles River Museum of Innovation and Industry. Cambridge Jazz Festival — $2,000 to provide free live jazz music at a public festival in Danehy Park on July 28th Noon – 7:00PM. Central Square Theater — $7,500 for the implementation of Youth Underground’s multi-year civic engagement theater project, Act Up & Vote! Dance Complex, Inc. — $15,000 for All In Movement (AIM): workshops, performances, crossover public art that places those who may be considered “other” at the center of art-making. Providing movement experiences with no barriers to participation, AIM connects with the community in new, meaningful ways and increases dance/movement literacy and awareness. Dancing Queerly — $1,500 for a festival of workshops, performances, social events, & panel discussion, by & for the LGBTQIA+ community, its allies & friends. Gallery 263, Inc. — $2,000 for capacity building to ensure it can continue to provide high-quality, low cost artistic programming to the community for years to come. José Mateo Ballet Theatre — $5,000 for Dance for World Community Festival Week, June 3-8, 2019 and DWC Presents dance event series in March and April 2019. Midday Movement Series — $2,000 to support emerging contemporary dance teachers and professional dancers by providing classes at deeply subsidized rates to make it affordable for artists to work in Cambridge. Shelter Music Boston — $2,500 for Transformative Concerts at CASPAR Emergency Shelter which are the work of highly skilled professional musicians. Monthly performances create a sense of community built on the relationships developed between shelter guests, shelter staff, and musicians. Family Independence Initiative — $140,900 from CCF and partners in support of systems change project in partnership with the Dept of Transitional Assistance to develop a set of policy and practice reforms using the FII model to reimagine the welfare system based on the strengths of families. This pilot will enroll 100 additional families in Cambridge. BioBuilder — $25,000 from CCF to recruit more Cambridge students to participate in the Apprenticeship and Learning Lab program at Cambridge companies and academic labs. This innovation and youth development program secures new work opportunities in biotech companies in the area; partners with Cambridge schools; trains students, teachers and residents through the Learning Lab. Falcon Pride Scholarship Fund — $10,000 from CCF this spring to provide scholarships. Envisioned by parents and alumni of CRLS, in partnership with CCF, the scholarship fund is designed to support CRLS graduates, reducing financial need and uncertainty, by giving students a $1,000 scholarship for their first year of post-secondary education and $1,500 for their second year.